The most recent Conscious Connection eco-surf trip took us off the beaten path to San Juan Del Sur, a quaint tropical town centered on a beautiful harbor in the Republic of Nicaragua. This secluded region is known for beautiful Pacific Ocean vistas, world-class surf breaks and authentic Nicaraguan culture. The idea for this trip arose several weeks ago when members of our surf travel team began tracking a large swell building thousands of miles off the coast of New Zealand. When we saw the Nicaraguan surf forecast predicting historic ground swell periods of 6+ feet at 24 seconds, we made the last minute call to book our trip. This Nicaragua Surf Travel Guide will discuss everything you need to know to plan an amazing surf vacation in San Jan Del Sur. But first, a word about what you need to pack before you even get off the ground. In addition to typical surf vacation necessities, we recommend packing an extra-strong board leash, a car charger / back-up batteries for your cell phone, roof straps for your boards and a rash guard. The closest airport to San Juan Del Sur is Nicaragua’s International Airport (MGA) located in downtown Managua. Depending on the length of your flight and the time of your arrival, you might want to spend your first night at the Best Western near the airport before making the trek to San Juan Del Sur. The Best Western is inexpensive, air conditioned and includes a full breakfast buffet. There are several options to get to San Juan Del Sur from the airport. Adventurous, budget-conscious travelers can pile onto a local bus for about $5. The second option is a transportation service. We recommend Gaby Transport or Adelente Express. Both businesses have been run by Richard Morales for over 30 years. Richard will make sure you get to where you’re going safely, efficiently and in a well maintained, air conditioned vehicle. Their shuttles cost $45 per person; if you prefer, you can choose a private vehicle for approximately $70-$80. The third option, which we chose, is to rent a car for about $400/week. If you choose to rent a car, it’s not recommended to drive at night due to the pitch-black roads and local wildlife that tends to wander into the streets. You’ll also want to make sure to rent a 4×4 since the beaches are all accessed via dirt roads. Be forewarned: we would have been completely lost had we not discovered that Google Maps on the iPhone somehow works completely devoid of any cellular or Wi-Fi connection. We strongly suggest that you load directions onto your phone before heading out on the road for this two-hour drive, and be sure your car charger is handy. Upon arrival in San Juan Del Sur, we drove past the beautiful historic harbor and a bustling downtown beach area. We also arrived in the midst of a total town blackout and significant road construction. Fortunately, we had reservations with the Hotel Villa Isabella, which was more than prepared for such an event with a powerful generator capable of running the entire hotel for several days. As the entire town suffered without power, we happily checked into our comfortable, air-conditioned rooms. The hotel was founded by honorary locals Mike Iacoboni and Jane Mirandette, who fell in love with the area many years ago and built the hotel to be a sanctuary for travelers and surfers alike. Mike and Jane are also deeply committed to the social development of the region. When we first encountered Mike, he was in front of the hotel helping some of the local schoolchildren with their homework. Jane opened the town’s first public library, and went on to found The Hester J. Hodgdon, which teaches those interested in starting a library how to do it. Imagine if you knew of a place with perfect waves, uncrowded breaks and offshore winds 300 days of the year. Well stop dreaming because that’s exactly what we found in Southern Nicaragua on the beaches and breaks surrounding San Juan Del Sur. The town experiences these amazing waves due to the offshore wind generated from its ideal position between Lake Nicaragua and the Pacific Ocean. These are the very same winds that allowed Christopher Columbus to discover the New World. The trade winds blow from east to west across Southern Nicaragua. In the winter, the South Pacific comes to life with long period groundswells coming from storms generated off of New Zealand. We had the good fortune to experience a monster swell, which turned out to be the biggest in years on the entire west coast of Nicaragua. We found ourselves further blessed with warm water and relatively uncrowded breaks. 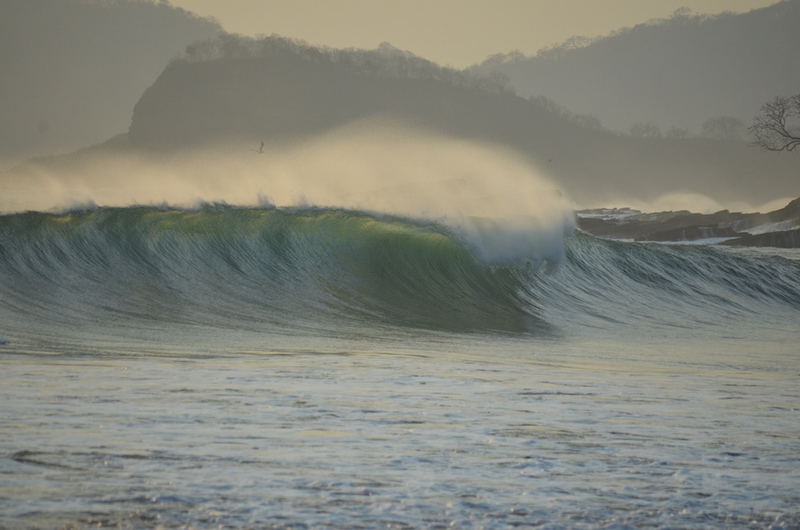 The other distinct feature of the surf in San Juan Del Sur is the frequency of the waves. From April to June, it is common to experience extra long period ground swells in the 22-24 second range. This creates extremely powerful waves with top notch quality. While you can long-board in Nicaragua, this combination of offshore winds with ground swell power makes for a short border’s paradise. Because the coast of San Juan Del Sur faces southwest, any good south to southwest swell marches right into this stretch of Nicaragua producing picture perfect machine-like waves. The reefs and points feature the long-period groundswells, while the beach breaks favor shorter-interval swells. The region experiences the best swells from March to November with the largest swells generally produced from April to June. Torrential rainfall can be experienced during the summer months and high tide is always the best time to surf, especially when swells are coming from the west. There are literally hundreds of spots to surf in Nicargua. While many of them are known only to the locals, many of them will offer to take you there for a fee. Here are some of the spots we checked out that we recommend for a first visit. Playa Maderas, the most popular surfing beach near San Juan Del Sur, is a 20 min ride north of town. This shoreline predominately features a beach break that breaks year-round. Waves are solid and cater to a variety of surfing abilities with a left and a nice right. Because Maderas is known for its outstanding wave quality, it can draw a crowd. Expect to share the line-up when you are here. Playa Marsella, located right next to Playa Maderas, is a beautiful beach for a swim or laying out. If the swell gets extra-large, Marsella is a good spot to catch a soft, head-high left that breaks at the south end of the beach. Pictured above is Conscious Connection Founder, Anthony Chiaravallo, before paddling out here to catch the epic left shown in this article’s featured image. When the swell in Nicaragua goes over 30 feet, this is one of the best spots to hit (along with Popoyo, discussed below). Playa Colorado is the spot to go if you want to get barreled. You definitely won’t be surfing this spot alone, but if getting barreled in your thing, you will likely get some of the best in your life here. Playa Colorado is only accessible by boat about an hour ride from San Juan Del Sur. The day we visited the swell was a bit too big and a little out of control. Fear of breaking boards kept us in the boat. Playa Hermosa lies about 30 minutes south of town. Although last year’s filming of Survivor Nicaragua prompted the assessment of $3 per person parking fees, this mile-long stretch of beach still offers lots of empty peaks. Wave quality here is better than average, featuring A-frame waves, long walls, and the occasional barrel. This spot is fun for almost all skill levels, and provides a backdrop for amazing sunset sessions. Playa Remanso is a ten minute drive south of San Juan del Sur. Playa Remanso can be a great beach for beginners and pros alike, and is an optimal long boarding spot. When swells are big, they have great lefts and rights that fire at the entrance of the tear drop as the wave comes into the bay. When the swell goes XXL, you can watch pro surfers tow-in or choose to surf the left at 15 feet, which features easy takes off and nice long rides. Also noteworthy is a nice rip on the left side (aligned with the horse sculpture on the beach) that can take you out when your arms are fried from paddling. Playa Coco, about 40 minutes south of San Juan Del Mar, offers waves that both long boarders and short boarders can enjoy. Waves start getting fun at about chest-high and hold size up to double-overhead. While rights are usually longer than lefts, you can easily catch waves in either direction. As an added bonus, because this beach is only a few miles from Costa Rica, it offers great views of the legendary Witches Rock. Popoyo, though it requires a 2.5 hour drive off road or a 90-minute boat ride, simply can’t be ignored. This powerful reef break goes both left and right and offers long, powerful walls and an occasional session of thick barrels. It’s very consistent and magnifies even the smallest swell. This wave breaks over shallow reef and has been known to break long boards, so surf with caution. Just south of the break is a spot the locals call Beginners, as the spot is naturally sheltered by a rock formation. The surf here offers a nice long left; if the spot is picking up an SSW swell, it will wrap into the cove. We found the waves to be very mellow and crumbly, which is best for a long board. Our team scored a few 300 yard rides here, along with plenty of stoke. Our search for epic waves in Nicaragua would not have been complete were it not for the guys at Nicasurf International. Owned and operated by Tom and Colin Eberly, they specialize in surf tours, boating excursions, and private/group surf lessons. Tom came here many years ago, set up shop as a board shaper and hasn’t left since. Now he and his son Colin spend their days on the boat helping traveling surfers find the perfect wave. When committing to this boat trip, be sure to have your sea legs ready. Anticipate potentially bumpy seas and at least seven hours on the water. Our advice is to take Dramamine if you’re prone to seasickness because once you’re out on that water, there’s no turning back. With that in mind, we loaded up the boards, packed a lunch and we were off. Our boat tour began moving north up the Nicaraguan coast from the famous surf breaks of Colorado and Popoyo in search of the perfect waves. Our first stop was a local beach break where we scooped up some other surfers in the midst of massive triple overhead waves. It was quite the experience witnessing 25-foot bombs rolling in a mile off the coast while dodging the sets in the fast-moving panga boat. But no worries, these guys are experienced boaters who will make sure you’re safe while simultaneously locating your ideal waves. They’ll be sure to find you exclusive breaks with perfect peaks only accessible via boat so you can enjoy the waves without interruption. Our trip to Nicaragua was the experience of a lifetime. With that said, the region still faces many challenges due to rampant abject poverty and lack of environmental sustainability. Fortunately, there are signs of progress. A slew of wind turbines is active over Lake Nicaragua, and socially responsible stewards like Mike and Jane are making efforts to improve the region. While we will not deny the pleasure we experienced on such amazing waves, we hope that our visit to Nicaragua will serve a higher purpose. Our goal with this feature is to encourage adventure-seeking travelers to visit Nicaragua and explore the rich history and diverse waves this wonderful land has to offer. This will ultimately serve two purposes: you will experience vacation of a lifetime, and the locals will benefit from an increase in tourism dollars to help create jobs and improve their quality of life. So what are you waiting for? Book your Nicaragua Surf Trip now!